I’m not usually one for resolution-ing in the gym. I have fitness goals for the year, don’t get me wrong, we all know about those. But I don’t typically buy in to the #newyearnewme thing. This year, however, I decided to jump on board with something that my gym is doing – a month-long wellness challenge. Over the course of four weeks, participants are asked to complete at least four of the listed challenges and each week has a different theme. What I love most about this particular wellness challenge is how holistic it is. Yes, there are fitness-related items (complete 500 push-ups or pull-ups in the month, row a marathon by the end of the month, etc. ), but there are also items related to mindfulness, nutrition, recovery, mobility and even water intake! Set two performance goals and share with a coach – mine are to improve my overall gymnastics skills with the endgame being to be able to do muscle-ups, and to be able to string together big sets of doubleunders. Partner skill work – Clay and I stayed after class a few times to work on our doubleunders. 500 push-ups in the month. So far, i’ve completed 204/500! Eliminate one of the following items for the entire month and keep a journal to describe how are feeling: Alcohol, sugar, soda, dairy, gluten. We chose to eliminate alcohol – and Clay is actually attempting to eliminate it for the whole year. I will probably do the same, as I just don’t feel my best when I drink and my body doesn’t recover well at all. Consume half your body weight in ounces of water per day for the week (e.g. you weigh 150#, you would consume 75 ounces of water.). Do not exceed 100 ounces per day. Prepare or cook all of your meals this week. No fast food or prepared foods. Track and record your food intake for one week and share it with a coach. I use MyFitnessPal regularly, so this one is pretty easy for me. I am trying to be more accurate in my logging, though. So far, so good! 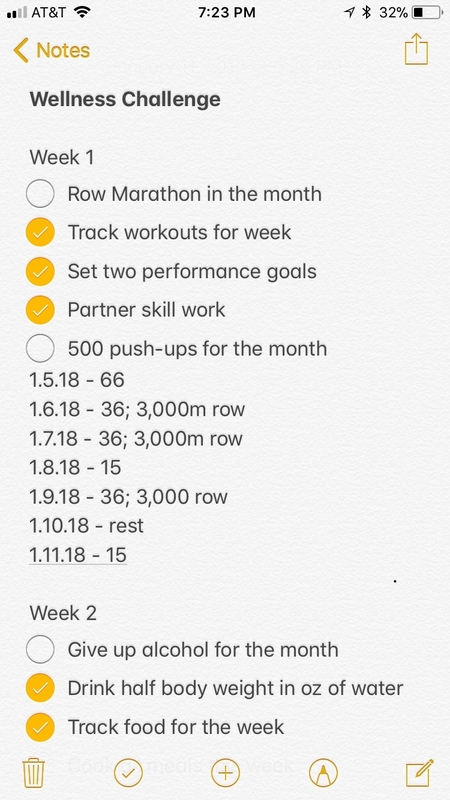 We’re chugging along on our month-long items (we have MANY more meters to row still), and we’ve set our goals. I’m looking forward to seeing what we can accomplish in the next couple of weeks! This entry was posted in Workouts and tagged crossfit, crossfit kingstowne, fitness, january, kyle, new year, wellness, wellness challenge. Bookmark the permalink. I had slacked on tracking my food – and it really is a way for me to stay more mindful, not of the calories, but of the quality of food I am eating, so I made it a goal to get back to tracking! Sounds like that wellness challenge is well rounded!